Coming off a big win last night at home in Minneapolis, the Wolves are in Oklahoma City to take on Kevin Durant and the Thunder tonight. Tip is at 7 P.M. CST. It can be seen on FSOK or League Pass or heard on WCCO 830. The Wolves, now 24-24 on the season, are 4-8 on the second night of back-to-backs. And tonight’s will be among the most difficult of them all. The Thunder (39-11), as we know, are one of the best teams in basketball – with or without superstar guard Russell Westbrook, who will again be out tonight for the Thunder. The Thunder lead the season series against the Wolves 2-1. Some keys to tonight’s game are below the fold. If you see this man in Minneapolis tonight, don’t look directly at his shirt or you might go blind. The undefeated Minnesota Timberwolves, fresh off of a season-opening victory in overtime against the Orlando Magic, take on a more formidable opponent in the Oklahoma City Thunder tonight at Target Center. You should watch it if you want to see how the team responds to the trouble it had putting away a lesser opponent, and to see how they stack up against one of the better teams in the Western Conference. Sometimes the simple game flow image tells 90 percent of the game story. 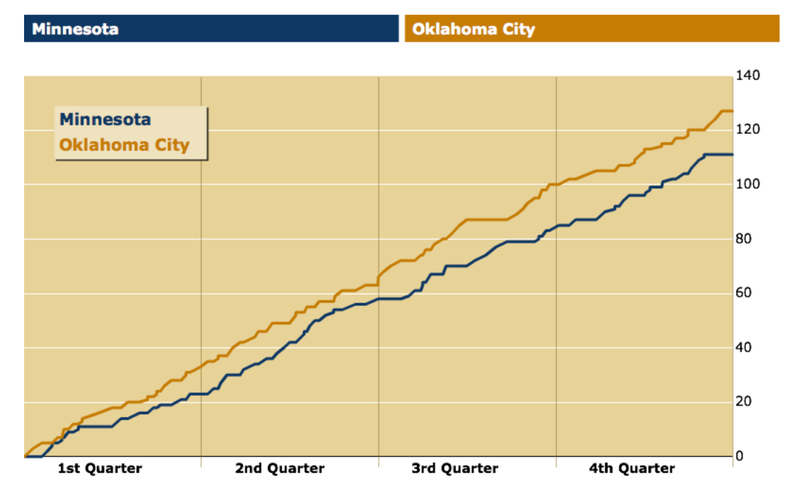 Last night the Thunder built an early lead — 10 points after the first quarter — and never looked back. The Wolves almost had the lead cut to 5 at half, but Luke Ridnour blasted Russell Westbrook as he attempted a desperation trey at the horn, sending him to the foul line for a gratuitous three points. The 8-point halftime deficit was as close as the game would get from that point forward, with much of the second half showing the Thunder ready to blow the game completely open. They led by as many as 17 points at different moments and ultimately won by 16. It was not a close game, nor was it a particularly interesting game to dissect. But there were some sub plots. If ya don’t know, now ya know — Oklahoma City has a great pro basketball team. Here’s something interesting about that: OKC’s winning percentage is .727 — obviously great — which if the season ended today would mean improvement for the FIFTH consecutive season. 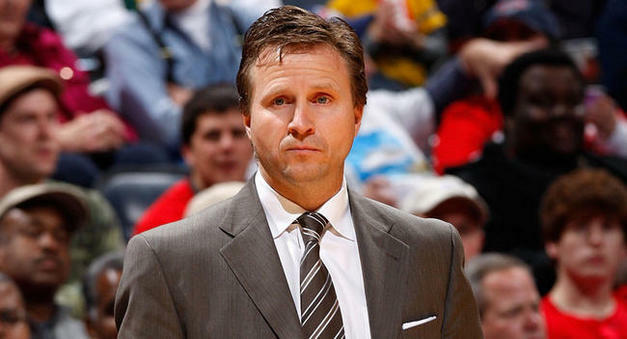 Coach Scott Brooks takes an undue amount of heat (Bill Simmons took his umpteenth jab at him during ESPN’s pregame show, not-so-subtly suggesting that Russell Westbrook’s temper tantrums are somehow on Brooks) for a coach who inherited an incredibly young, 1-12 team and has molded them into a steadily-improving Western Conference superpower. Obviously the talent of Russell Westbrook and Kevin Durant — on full display last night — is the overriding factor in the Thunder’s success. But there’s so little to criticize about such a successful team that it seems discussion for discussion’s sake leads to Brooks getting ripped way more than he should. In any case, the Thunder are awesome and reminded everyone of this last night. Durant was his usual studly self. He poured in 27 smooth points along with 7 rebounds and 7 assists. When standing near the Wolves sideline during free throws, he took a moment to extend well wishes to Rick Adelman and family, dealing with a scary medical situation. Dude is true class. Russell Westbrook, whose volatility perhaps makes him less endearing to fans, was the better of the two superstars on Friday night. Russ had 37 points, 9 assists, and 7 rebounds. When he’s hitting that mid-range pull up he’s just a half-click below LeBron James on the Unstoppable Scale. His historically-ridiculous explosiveness was on display when he was isolated one-on-one with Alexey Shved. Shved is very good at staying in front of dribble penetration, erring on the side of backing off too far. But Westbrook made him look knee-deep in quicksand, cruising past back-pedaling Shved for an easy two. So yeah, the Thunder are good. This isn’t news, but it is the primary piece of information gleaned from last night’s loss at Oklahoma City. Getting beat in this game (given opponent, back-to-back, and injuries) is not unexpected. But it's getting a little ugly out there. The Wolves had plenty of them. Coach Rick Adelman remained away from the team, for the second consecutive game, for undisclosed personal reasons. Without more (or any, really) information, I won’t comment other than to say I hope everything is okay with the Adelman Family and he comes back soon. Along with Adelman’s absence was the continued loss of Chase Budinger and Kevin Love. Love indeed does need to have surgery and the expected recovery time is 8 to 10 weeks. That means roughly 30 games. That means the Wolves need to figure out an alternative path to the playoffs that they have explicitly labeled as the team’s 2013 destination. J.J. Barea also sat out tonight with back spasms. You might recall that he dominated the 4th Quarter of the Wolves recent win over OKC. Along with absent players and coaches was the simple fact that the Wolves traveled last night and were playing on 0 nights rest. Their opponent, who also happened to be the best team in the conference, had not played since Monday; a night they lost to the lowly Wizards. Oklahoma City was certain to come out looking for blood in tonight’s game. All of this is to say the Wolves were not favored to win. The excuses were built in. The Wolves got a nice win over Atlanta last night at Target Center. Tonight they have the Thunder, in Oklahoma City, on the wrong end of a back-to-back against the team with the second-best record in the NBA. As nice as last night’s tilt was, the Wolves are in for a long night if they aren’t ready from the get-go tonight. The Thunder are really good (26-8). They have freak athletes (see Westbrook, Russell; Ibaka, Serge; and, of course, Durant, Kevin). They don’t have James Harden anymore, but they do have a former Mr. Efficiency, Kevin Martin, whom they received for Harden and who missed the last game OKC played against Minnesota, when the Wolves beat the Thunder 99-93 in Minneapolis on December 20th in one of the signature wins of the post-Garnett era. Will Scott Brooks be Dungy’d?